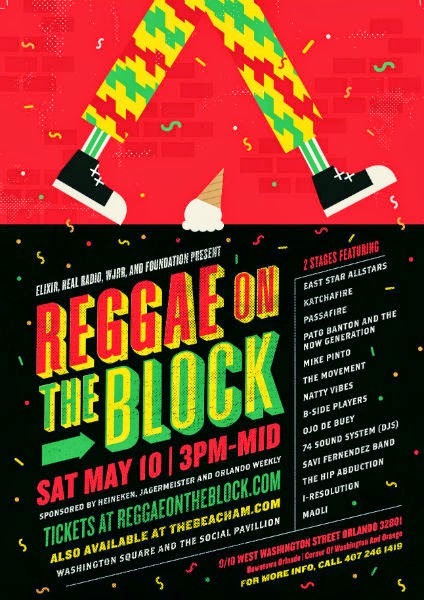 On Saturday, May 10, from 3 p.m. to midnight, Social Pavillion and Washington Square in downtown Orlando will host the first annual Reggae on the Block music festival. For just $20 ($50 for VIP), you can experience nine hours of roots reggae music from some of the best local and legendary artists, including Easy Star All-Stars, Passafire, The Movement, Savi Fernandez Band and I-Resolution. A total of 14 artists will perform on two stages and there will also be 50 food, drink, and merchandise vendors to patronize as you enjoy the island sounds. Reggae music originated in Jamaica and combines traditional styles with elements from a variety of genres, such as rock, soul, rhythm and blues, and jazz. It is characterized by syncopated rhythms, heavy bass, and socially conscious lyrics. Reggae on the Block is sponsored by Heineken, Jagermeister, and Orlando Weekly and is presented by Foundation Presents. It is an all ages event. Tickets can be purchased online by visiting thesocial.org. Subscribe to Live Music Is Evolving's weekly update or like it on Facebook for information on other conscious music events happening in Central Florida.